With just over 36 hours to go to a national three-day strike by nurses, there is still no sign of a breakthrough that would see the industrial action suspended. Exploratory talks are continuing at the Labour Court but sources are not indicating any significant progress. The action by up to 40,000 nurses remains set for Tuesday, Wednesday and Thursday. If the strike proceeds, it will include the Psychiatric Nurses Association's 6,000 members for the first time, who up to now have only engaged in an overtime ban. 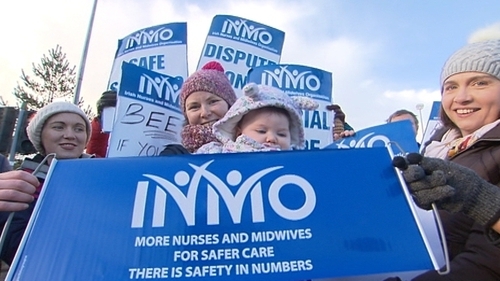 If a proposal were on the table, the INMO could only suspend the strike through a meeting of its executive. However, informed sources confirmed that the executive has not been put on standby to meet. The Psychiatric Nurses Association gave a presentation to the Labour Court yesterday but is not at today's resumed talks. Meanwhile the HSE has voiced serious concerns about risks to patient care not just in anticipation of the three-day strike, but also from the cumulative effects of three strikes which have already taken place. The fact that the management side at the talks is being led by the Secretary General of the Public Expenditure and Reform Robert Watt is viewed as an indicator of how serious the situation is. The Department of Public Expenditure and Reform oversees public sector pay and is understood to be extremely concerned that granting the nurses' demands would be unaffordable, breach the current Public Service Stability Agreement and trigger widespread knock on pay claims across the public service. However, nursing unions continue to insist that they deserve pay parity with other graduate health professionals, and that a pay award can be made in situations where there are recruitment and retention difficulties within the PSSA without consequential demands from other unions. It is hoped the exploratory talks could see progress reach a sufficient point to warrant a formal Labour Court intervention and that the INMO and the PNA would suspend the strike pending the outcome of that process. But that is by no means guaranteed and as of now the strike is set to go ahead, resulting in further thousands of patients having medical appointments cancelled. The sides emerged from the Labour Court in the early hours of this morning after marathon talks, with little to say. The Labour Court had a full briefing of all the issues in the dispute covering the recruitment and retention of staff and pay parity with other healthcare graduates. The Irish Nurses and Midwives Organisation and the PNA attended, along with Health Service Executive management and representatives from Government departments. Emerging afterwards, the General Secretary of the INMO, Phil Ní Sheaghdha, said: "All the issues have been explored to death but the bottom line is this is still in the exploratory stage." She confirmed that unions were "still organising a dispute for Tuesday, Wednesday and Thursday." Yesterday, tens of thousands of people took part in a rally in Dublin in support of nurses and midwives who are involved in the dispute.